Step into the world of a DJ and youll surprise not only your friends and rivals, but also yourself with In The Mix featuring Armin van Buuren. This Wii game gives everyone the chance to mix Music like a real DJ. Using the unique capabilities of the Wii you can start DJ-ing in an instant. It includes more than 60 famous tracks by Armin van Buuren and other artists, and 30 special remixes. In career mode you will work your way up from underground clubs to stadiums to become an international superstar. In party mode you are left entirely free to mix the music in the way you want, and to show off your newly-learned skills to your friends. In studio mode you can use samples and loops to easily create and save your own tracks. You can then use these tracks in party mode. 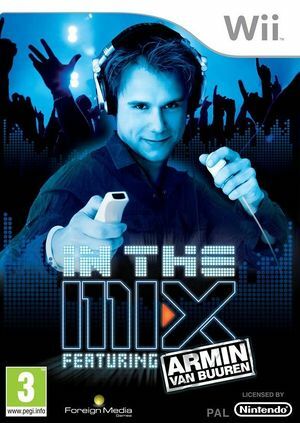 In The Mix featuring Armin van Buuren has something for everyone. The graph below charts the compatibility with Armin Van Buuren: In The Mix since Dolphin's 2.0 release, listing revisions only where a compatibility change occurred. This page was last edited on 24 January 2018, at 00:23.